For the final day under Biryanis I made Prawns Biryani. I already have a version of Prawn Biryani, and wanted to try from a different cuisine. Today’s version is from Kerala cuisine. It’s also called as the Shrimp or Chemeen Biryani. I landed here and almost followed the recipe. Since I was cooking along with Amma, I was able to follow the instructions, else I can never keep up with one. Prawn Biryani will always remind me of Amma’s lost recipe. During our initial years of marriage, Amma used to make a prawn biryani and Hubby dear used to love it. Somehow she stopped making that version and suddenly she forgot how she used to make it. However much she tried, she simply couldn’t remember and we sadly concluded that, that recipe is lost forever. So I try other version in vain hope to arrive at that recipe again! Wash and soak the rice in water for 30 minutes. Drain the water completely. Bring to boil 6 cups water with half the quantity of whole masala, keep it aside. Meanwhile heat ghee in a a non stick pan, add the remaining whole masala and add the drained rice. Fry the rice for around 5 minutes or until the rice starts cracking. Add the boiled water, lemon juice & salt. Cook till the rice is done and water is completely dried. Spread the rice in a tray & keep aside. Marinate the prawns with 1 tbsp of ginger garlic paste, red chilli powder, pepper powder and salt and keep it for 2-3 hours in the fridge. Meanwhile grind together a handful of coconut & coriander leaves with a little water & keep it aside. Also grind the soaked cashews into a smooth paste. 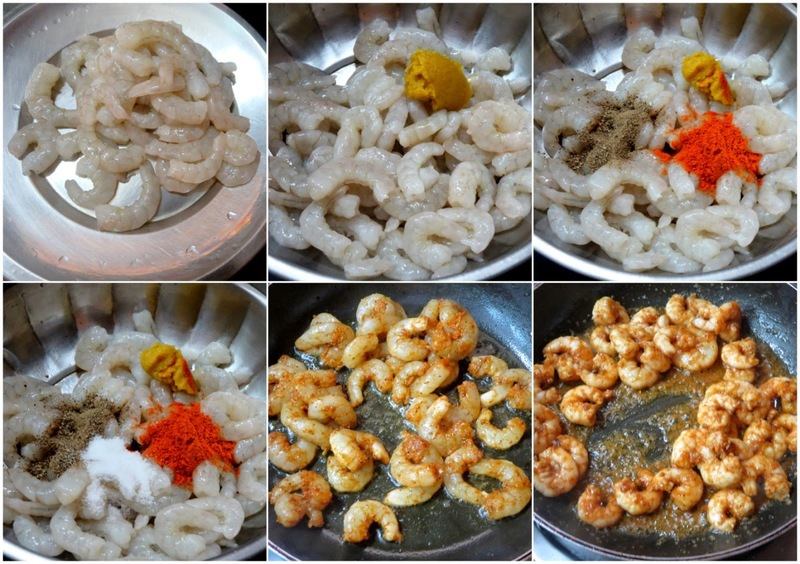 Shallow fry the marinated prawns when you are ready to make the biryani. Once the prawns are fried, keep it aside and use the same oil to cook onions, remaining ginger garlic paste and green chilli. Once onions are fried well, add chopped tomatoes. Once the tomatoes are cooked, add curd, coconut, coriander leaves paste. Once it boils add fried prawns and cook in low flame for 5-6 minutes. Add the cashew paste & 1 tsp of garam masala. Mix well. Cook for 2 more minutes & remove from fire. Heat ghee in a pan and fry the cashews and onions till it becomes golden brown. Drain the excess ghee in a paper towel & keep it aside. In a greased pressure cooker, layer the biryani. First layer with rice, followed with prawns masala, then fried cashews and onions, Repeat the layers, making sure the top layer is rice. Cover with the lid and ensure it’s tight. Place this on a tawa, and simmer for 20 – 30 mins. That is a sad story about the lost recipe. Hopefully you will find something close soon. I am sure this recipe will substitute the lost one..long list of ingredients. A good biryani for prawn lovers. Wow! This biryani is inviting and tempting. Am hungry now, biryani looks flavourful and inviting. Awww! Keep reminding your mom about the recipe, maybe it will come back to her. That is a very flavorful prawn biryani. Aww so sad abt the lost recipe. BTw your pics are killing me wish I could just eat some.